Are Grapes Beneficial to Diabetics? If I’d be next to you, I would tell you: “Buy it!”J)) That is really funny, but it remains still a huge preoccupation. You can enjoy the picture of the grapes of my yard. They are naturally cultivated. Grapes are fruits, and all fruits of all types are the healthiest choices to diabetics. The problem is the sugar content in grapes that would consequently, limit their intake. 1. Water - the 70 to 80 percent of grapes consists of water. As our body contains water in the same portion, you might image the goodness of supplying our body with the needed water through grapes consumption. 2. Sugar – it consists of two main carbohydrates : fructose and glucose. It is calculated that ripe grapes contains up to 250 gram of sugars/L; while unripe grapes have more sugars. 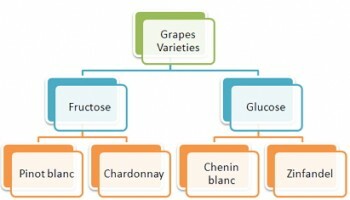 Different varieties of grapes have different proportions of sugars in their content as shown in the illustration. The more fructose grapes have, the more sweet they will taste. 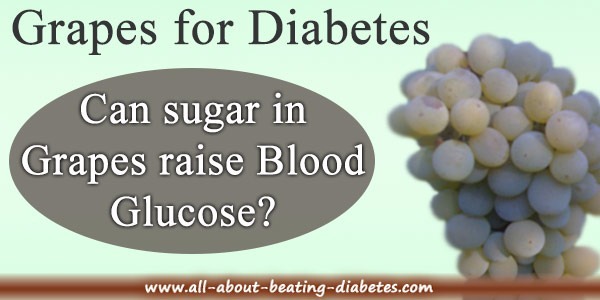 However, what effects blood sugar mostly is glucose, which is less sweet than fructose. Therefore, diabetics are recommended not to succeed one whole grape per day. Ideally, they are encouraged to consume grapes as a snack during the mealtimes. 3. Organic acids – they involve the major content of grapes together with sugar and minerals. As they give the tart taste to the berries, they play important roles in their color and pH. Tartaric acid, malic and citric acids, and amino-acids are the organic acids principally found in the grapes. It is to be noted the high content of tartaric acid in grapes as they are listed among those rare fruits with such content. As you may probably know, tartaric acid helps improving colon function, reducing the risk for colon cancer, which is of high rate among diabetics. 4. Minerals – the most important mineral found in grapes is potassium, up to 70% mineral-content of the juice. Other minerals include sodium, chloride, iron, sulfate and phosphates. As you may probably know, they play crucial role in many metabolic processes. 5. Phenols – as they play important roles in the aging and maturation processes, their main location include the seeds and skins of these berries. The phenolic substances are primarily located in the seeds and skins of the berry, enhancing the beneficial effects of it. 6. Pectins – for your info, pectin is listed among those agents that are helping in the cementing processes of the cells wall, leading to softening of the fruit while ripening. Their chemical component include galacturonic acid and associated molecules. 7. Nitrogenous and aromatic components are also important part of grapes. The review on main components of grapes indicate the importance of using them as part of the menu plan you are following although their sugar content, paying attention to the portions consumed. According to ADA (the American Diabetes Association), 17 small grapes contain 15 grams of carbohydrates, therefore, you should eat only one small piece of whole fruit. You can enjoy grapes while keeping blood sugar under control.